Do you own a business in or around Deerfield Beach and are you looking for a company to build a custom sign for you and install it? Look no further than Testa & Sons Signs! 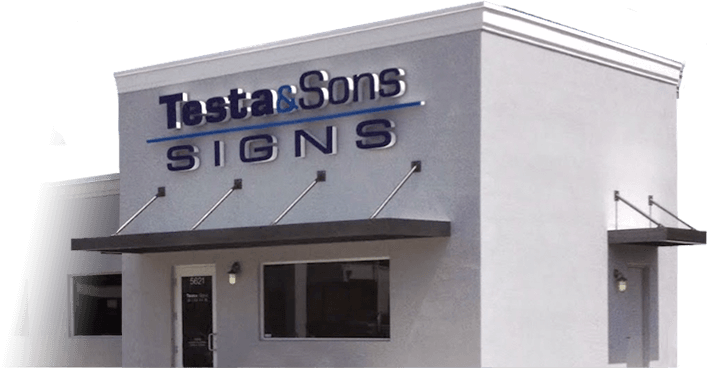 At Testa & Sons Signs, we have been in business for many years and have been working with countless business owners such as you by building custom signs and installing them at your place of business. By taking time to manufacture and install all of our signs, we end up providing the best possible results for each of our customers. Not only are our custom signs in Deerfield Beach precise, but our installation is also properly done so that your sign is sturdy and secure. When you need the best interior signage and effective storefront signs, you can depend on Testa & Son. Let us be your preferred choice for a sign company in Deerfield Beach. At our leading sign company in Deerfield Beach, we want to create the signs you truly depend on for highlighting your business. Turn to our top sign company for help when you want to get situated with an effective sign and proper installation. If you need more information or would like to get your custom sign project started, reach out to the professionals at Testa & Sons Signs today!